Our spine can be compared to the trunk of a tree which functions as a central axis that connects to all the various parts of the tree. If the trunk is weak, then it is unable to produce flowers and fruits. Patient examination room, treatment room that is fully equipped with medical tools and equipment. An operating theatre that meets high standard of quality and is equipped with advanced medical devices such as C-ARM (both 2-D and 3-D) and an MRI machine placed inside the operating theatre to assist surgeons during and after the operation and in some cases, used during the operation should any problems arise. Use of advanced technological medical devices in the diagnosis of spinal and joints diseases such as bone density machine, navigation system or an MRI machine. Around-the-clock services such as custom-shoes making, support equipment for the arms, legs and the body and support devices for both before and after surgery. A team of doctors who are specialists in all areas that are related to the treatment of the spine. This includes a team of neurosurgeons, plastic surgeons, rehabilitation doctors and trained and experienced physical therapists who prepared to provide rehabilitation services to patients suffering from spinal diseases or disorders. Our doctors will provide patients with close medical consultancy and advice on correct rehabilitation techniques on a continuous basis. There are many ways to treat spinal diseases and disorders in both Thailand and overseas. These include the area in the neck, chest, waist and the sacral vertebrae. Even though many private and public hospitals have high capabilities in performing many surgeries on patients with spinal disorders each year, the result of the surgeries vary, depending on the skill and expertise of the doctors and medical tools. Patients who have had successful surgeries would have had their conditions solved to a certain extent. However, patients who do not feel better even after a surgery may face other complications involving the patient, the treating doctor and the hospital. Some of the patients who have received successful surgery may face problems that surface later on. Looking after such patients can be challenging. 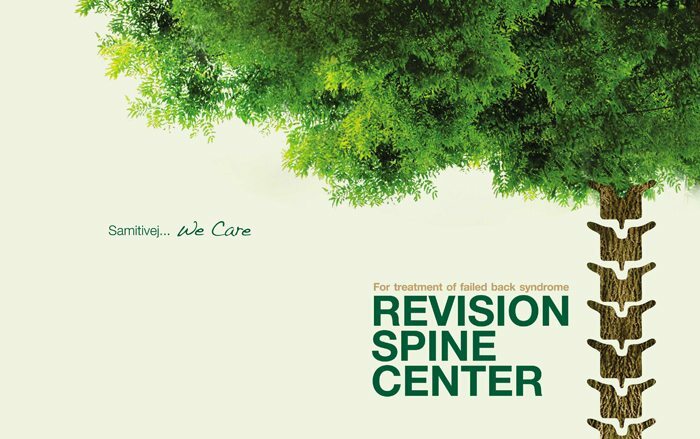 The Failed Back Center or the Revision Spine Center at Samitivej Srinakarin Hospital helps to solve the plight of such patients and in assisting overseas patients. The objective of this center is not only to provide treatment to patients, but also to educate and provide research opportunities to doctors who want to study further and better develop their ability to provide treatment to patients. Generating revenue is not the center’s main objective and this is why the center is prepared to provide care and treatment to all patients with Failed Back problems, regardless of whether they can afford to pay for the treatment or not. There is no guarantee that a back surgery will be 100% successful. A persistent back pain that occurs after a back surgery is called “Failed Back Surgery Syndrome (FBSS)” in medical terms. This condition can happen to anyone around the world. Most of the patients suffering from Failed Back Surgery Syndrome are those who have undergone a back surgery. Instead of recovering from the surgery, they experience increasing discomfort and chronic pain at the back. Many patients experience tormenting pain even after several years. Samitivej Srinakarin Hospital has a center that offers comprehensive medical services in the treatment of spinal diseases, normal spinal surgery, and revision spine surgery. This expertise has led the hospital to set up a “Revision Spine Center” or a Center to treat Failed Back to correct disorders that arise from back surgeries. This is the first center of its kind in Thailand and Asia Pacific region to help patients. Expertise of the doctor providing treatment or surgery. This is an important factor in the success of a spinal surgery and especially during a surgery to correct a failed surgery. The surgeon must be a specialist in spinal surgery and one who is highly experienced and elaborate. The patient and the type of spinal disorder that the patient is experiencing. This is also a major factor along with correct post-surgical care. If proper post-surgical care is not provided, then the different types of spinal disorders, osteoporosis and other underlying health diseases which the patients are experiencing and are undergoing treatment may cause problems after spinal surgery. The right technique and method can help patient relieve from pain and suffering. What is the level of pathology? Are there other neurological conditions? How much is the pain affecting one’s daily routine? The patient must receive an assessment of the condition and a senior physician at the center will decide on the appropriate course of treatment. Providing treatment and performing surgery will only be at the discretion of the spinal specialists of the center or it must be approved by the physician of the center. The physician who is providing treatment must be a medically trained specialist and a spine expert. Prior to surgery and post-surgery, the surgeons will continuously meet to discuss and analyze the result of the treatment. A systematic follow-up procedure will be conducted on the patients by the spinal surgeons and the rehabilitation specialist to ensure the effectiveness of the medical procedure. In solving the various problems, the doctor will have to evaluate each patient on an individual basis according to his or her condition. Failed back surgery is not necessarily a major surgery. There have been several cases where patients with slight herniated disc have also shown symptoms similar to those of failed back surgery syndrome. Techniques used in treating these groups of patients are complicated than treating patients who have not undergone surgery. Patients who have received failed back surgery must comply with the treatment program which may differ in each case. The surgeon will provide proper medical advice to patients; however, patients must also enquire how they should conduct themselves to avoid a recurrence of failed back. Remember that each patient’s condition and situation is different. This depends on the result of the surgery and how successful it is, the patient’s health condition and proper post-surgical care. At the center, our team of senior specialist surgeons, who are recognized by the orthopedic society, can provide solutions to all your spinal problems. Charoen Chotigavanich, PROF. EMERITUS, M.D. Chaiyapruk Pundee (Habeeb), Sqn.Ldr., M.D. Visal Kantaratanakul, Assistant Professor, M.D.